Seventeenth century East Riddlesden Hall stands on a small plateau overlooking a bend in the River Aire on its way downstream from the town of Keighley. The hall was built by wealthy Halifax clothier, James Murgatroyd in 1642. 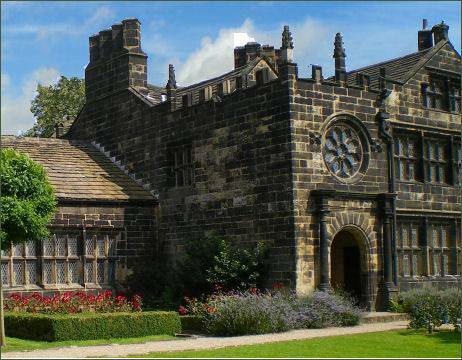 He also built other stone manor houses throughout the West Riding of Yorkshire. James Murgatroyd was a Royalist and this can be seen in royalist symbols and graffiti on and in the building. The Bothy has the heads of King Charles I and his wife, Henrietta Maria of France carved in the top most stone work. 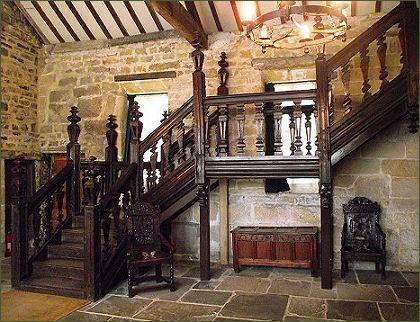 East Riddlesden Hall, which is reputed to be haunted, features the Great Hall, a large barn-like space with a huge fireplace and a fine collection of pewter, two Yorkshire Rose windows, a walled garden and the ruined Starkie wing. A hiding place for Catholic priests was installed during the sixteenth century. 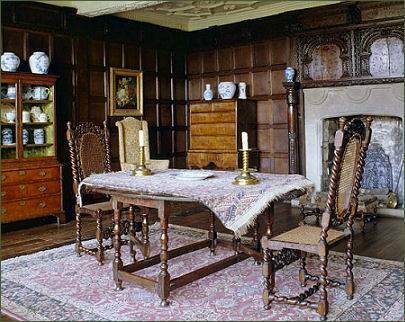 The hall contains much locally made period furniture, including a carved and canopied seventeenth century cupboard which was described by Emily Bronte in "Wuthering Heights".There is also a medieval tithebarn in the grounds. 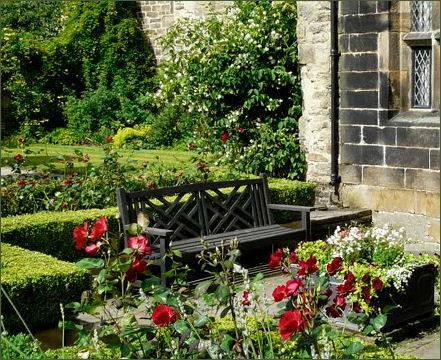 In the springtime the attractive gardens are filled with pink cherry blossom, daffodils and early clematis, while in summer they are awash with the fragrance of lavender and roses. There is also a Wild Garden, maize field, duck pond, children's playground, café and gift shop. Riddlesdon Hall is now owned by the National Trust.